Slough, 11th February 2013 – ANTARIS SOLAR, German provider of solar technology, has announced its co-operation with leading plumbing and heating merchant, PTS. The two companies will exhibit jointly at stand N2110 during this year’s Ecobuild, which takes place from 5th to 7th March at the ExCeL exhibition centre in London. Andrew Moore, International Sales Director at ANTARIS SOLAR, said: “Antaris Solar is delighted that PTS has decided to add the Antaris Solar eKiss range of off-grid solar PV battery systems to its renewable energy products portfolio.” eKiss is a unique and innovative way of generating power where there is no access to a electrical grid connection. PTS provide a country wide opportunity for consumers and businesses to gain access to the eKiss range for the first time. During this year’s Ecobuild, ANTARIS SOLAR will showcase its two stand-alone, portable photovoltaic systems, the eKiss and the even smaller Mini eKiss. Both can be used to generate power in off-grid locations such as stables, outbuildings, sheds, camp sites, hunting cabins or holiday homes. They are also ideal for governments, charities, individuals, aid agencies and churches wanting to fund electricity supplies for families and small businesses in rural areas of the developing world. Available in four versions covering a power range between 350 and 2,000 Watts, the eKiss (short for energy – Keep it simple & safe) system is easy to install and operate and uses maintenance-free AGM batteries for electricity storage. Depending on the configuration, potential applications include washing machines, refrigerators, telephone systems, televisions, laptops, portable power tools, e-bikes, electric golf trolleys and even caravans. Each e-Kiss system consists of three components: the polycrystalline ANTARIS SOLAR PV modules; inverters that convert the electricity from direct current (DC) to alternating current (AC); and batteries that store the electricity generated by the solar panels. Up to eleven PV modules can be connected to the eKiss Box. Each system is customised to the customer’s individual power requirements. In addition, the Mini eKiss system is a briefcase-sized solar charging box with pluggable panels and a maintenance-free 12 V DC lead-acid battery, complete with an on/off switch. It has a maximum output of Max 100W and is perfect for powering small fans, battery chargers, laptops or mobile phones. For further information and details of where to buy eKiss please contact Andrew Moore at ANTARIS SOLAR in Slough, Berkshire, tel. 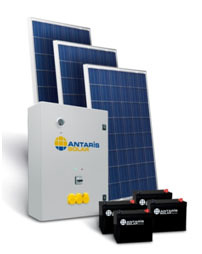 01753 569 270, mobile 07949 489 911, email: andrew.moore@antaris-solar.co.uk. For more information on PTS call 01788 527700, visit www.ptsplumbing.co.uk or text PTS or SPARES to 83332 to find your nearest branch.